Call the AHLA: The ADA Won’t Go Away! 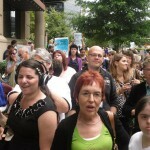 You are here: Home / Civil Rights & the ADA / Call the AHLA: The ADA Won’t Go Away! 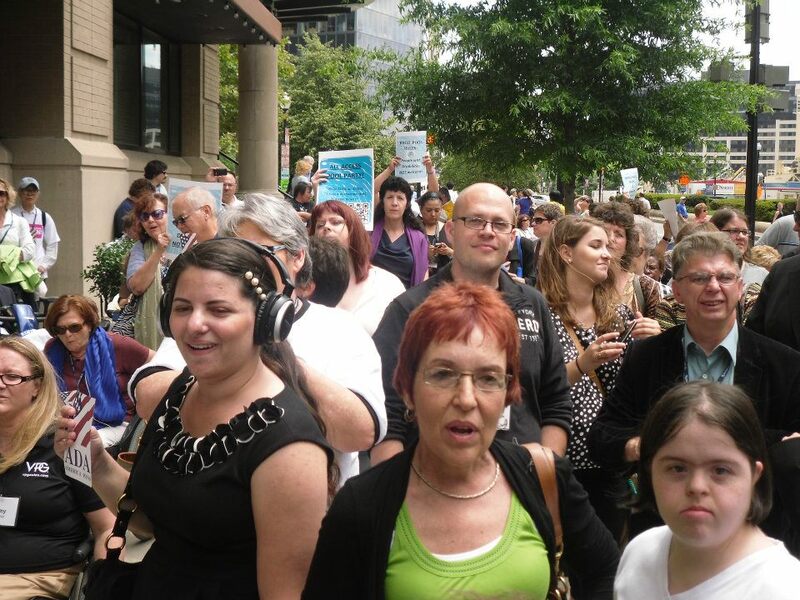 Kelly Buckland, NCIL’s Executive Director, along with NCIL ADA / Civil Rights Subcommittee Chair Mark Derry, led the crowd to the AHLA offices to let them know that we will not stop fighting their efforts to roll back our rights! NCIL members let AHLA know that their discriminatory actions to delay implementation of ADA rules will not go unanswered by millions of American’s with disabilities. History: In March 2012, the United States Department of Justice (DOJ) issued a delay in the implementation of the rule covering Pool Lifts for Public Accommodations. The delay was mostly requested by members of the AHLA. After a review of comments, the DOJ delayed the implementation of the rule to January 31, 2013. This gives hotel owners almost a full additional year to comply. Yet, they still don’t want to obey the law! NCIL will continue to fight against such discriminatory legislation and political movements by large industries to weaken the ADA. Stay up to date with information in the WhAM! Follow us on Facebook and Twitter using the icons below. For more information on this subject and the protest, contact Dara Baldwin, Policy Analyst, at dara@ncil.org.